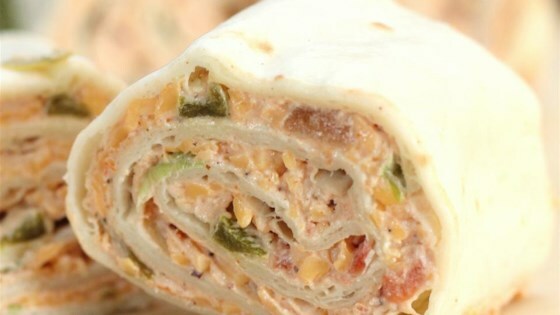 "These rollups are always a HUGE hit with the kids as well as the adults. A creamy, cheesy salsa mixture provides the filling. They are easy to make and may be prepared in advance." In a medium bowl, mix the cream cheese, sour cream, fiesta-style ranch dressing mix, chunky salsa and Cheddar cheese. Spread even amounts of the mixture onto the tortillas. Roll tortillas and chill in the refrigerator until ready to serve. To serve, slice the chilled, rolled tortillas into 3/4 inch slices and arrange on a large serving platter. These were a big hit at the party. I added thinly shredded lettuce, minced onion, and chopped black olives. Layering these items worked as effectivly as adding them to the mixture. Though this recipe was well received I found the flavour too intense. I think I will adjust the amount of package flavouring to half and maintain the rest of the ingredients as they are. I added some chopped black olives and a couple of green onions to improve texture. Easy to make and quick to disappear! Quick & Easy & Tasty! I nuked the tortillas for 10 seconds so that they were easier to roll up. I also cut them in 3" sections, less work that way! These were a big hit at several parties. I might add some olives or nuts to them next time. I also made these ahead and froze them. iT tastes good, is easy to Make and It is Fun.